MEXICO CITY (Reuters) – Mexico’s banking stocks plummeted on Thursday after a senator from the president-elect’s party unexpectedly presented a proposal to stop banks from charging certain commissions, deepening fears about the leftist’s economic policy. Mexico’s S&P/BMV IPC stock index fell 5.8 percent, its biggest one-day loss in more than seven years. Shares in Grupo Financiero Banorte <GFNORTEO.MX> tumbled nearly 12 percent, and Santander’s local unit <BSMXB.MX> dropped 8 percent. Inbursa, which is controlled by the family of billionaire Carlos Slim, and the bank Gentera <GENTERA.MX>, both fell about 10 percent after the news that President-elect Andres Manuel Lopez Obrador’s party was unveiling the bill. His Morena party, along with leftist allies, have a solid majority in both houses of Congress. It was the second shock to Mexican market in less than two weeks. Stocks and the peso were hammered earlier this month after Lopez Obrador, who takes office on Dec. 1, announced he would scrap a partially built $13 billion new airport for the capital. “All of this is by the book of what every other leftist government has done in Latin America: governing by referendum, then going after the financial conglomerates,” said Santiago Arias, a portfolio manager at Credicorp Capital Asset Management in Santiago, Chile. “There was a hope that Lopez Obrador would be a little more conscious about how he would approach the private sector,” he said. Following the steep market declines, the party sent a more conciliatory message. Ricardo Monreal, Senate leader for Lopez Obrador’s Morena party, stressed that legislators would take the financial institutions’ concerns into account. “While we recognize the aim (of these initiatives) is to try to improve the living conditions of Mexicans, this objective will not necessarily be achieved unless impacts on public finances and stability in the financial sector are taken into account,” he told reporters. 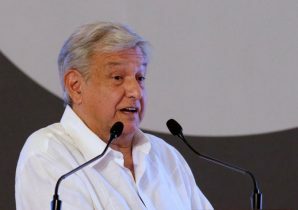 Lopez Obrador did not comment on the bill in a video posted Friday where, sitting in the back of a army truck, he detailed plans to add more runways to a military airport. The banking initiative, submitted by Monreal, argues that banks in Mexico earn more in commissions than in other countries. Mexico’s banking sector, which is dominated by foreign-owned banks such as Citigroup’s <C.N> Citibanamex and Spain’s BBVA Bancomer, has been a frequent target of leftist politicians in the country. Lopez Obrador won a landslide victory in July. Mexico’s last leftist administration mounted a disastrous privatization of the banking sector in 1982. The bill referenced a study by Mexico’s financial products watchdog Condusef that said 30 percent of Mexican banks’ revenue on average comes from commissions. It would prohibit financial entities from charging clients for checking a balance, withdrawing cash and requesting past bank statements, among other things. The plan would also require the Bank of Mexico and Mexico’s banking regulator to create a plan to annually lower commissions on bank transfers. Several bankers told Reuters on condition of anonymity that the proposal caught them by surprise. Banking association ABM said in a statement that it would analyze the bill and work with lawmakers and regulators to “strengthen transparency” around financial products. Condusef said BBVA Bancomer made 36 percent of its revenue in Mexico from commissions, while Citibanamex and HSBC earned one third. Banorte was the next highest, with 31 percent of its revenue from commissions. Banking experts said the bill’s backers should have laid the groundwork by meeting with financial groups and presenting public studies rather than unexpectedly proposing the bill. “What scares people … is the way they do it,” he said.